Z is a hard letter to paint a sign around. And that's all I have for the letter Z. Although I can maybe stretch my link just a bit by showing you a giant sign I painted for my guest room. It's quite large (24" x 48") but Mr. Jenny has confiscated it for over the fireplace in the living room. I don't have it a wire on the back yet to hang it, but here it is just kind of sitting around. It was supposed to invoke ZZZZZ's so I guess it kinda/sorta counts! The zig zag sign is on Etsy. The big one isn't shippable. To visit other links to the letter "Z", just click here. Oh who needs more- we're all zig zaging in life and are becoming oh so dizzy to read anyway! Are you ready for Thanksgiving? 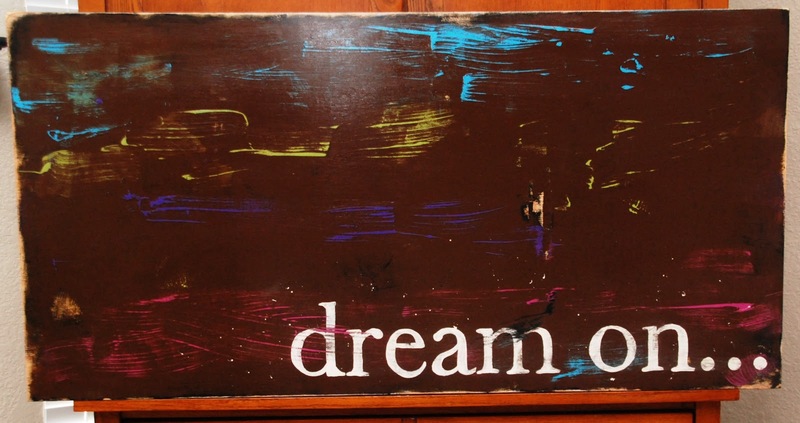 I love your dream on sign! That is great! You have such a "zippy" personality whopping up these cool signs! Happy that Mr. Jenny hasn't confiscated it for IN the fireplace in your the living room :) ! Looks very nice and yes Z besides zzz...zzz...zzz... is not an easy letter ! Great (as always!). Dream on indeed. Awaiting the next installment of your story, my friend. Love both these signs. The "dream on" one is way cool. I think Mr Jenny would be very sad if the big one left home. These are both great for Z! You've done it--painted signs for every single letter of the alphabet! Jenny, your signs are ALL awesome!